3/4'' Plywood for back piece- any size you want! 1x2 boards for decorative pattern- as many as you want cut to random sizes. 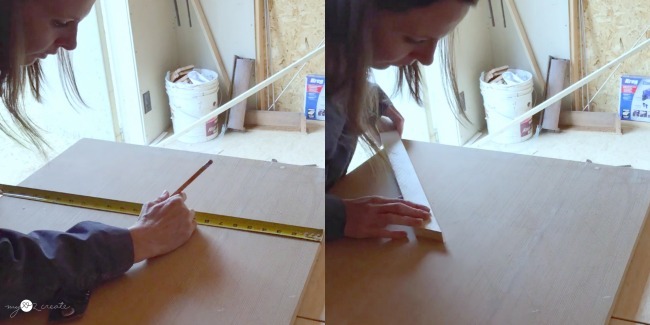 I had a large scrap piece of plywood and so I just let that determine my size. It wasn't square originally, but I ended up cutting it down to square eventually. 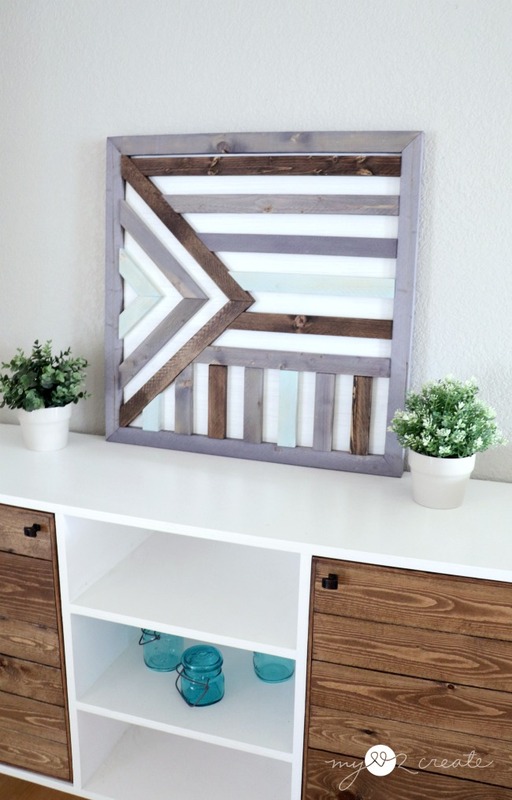 You can make your plywood any size or shape you want! 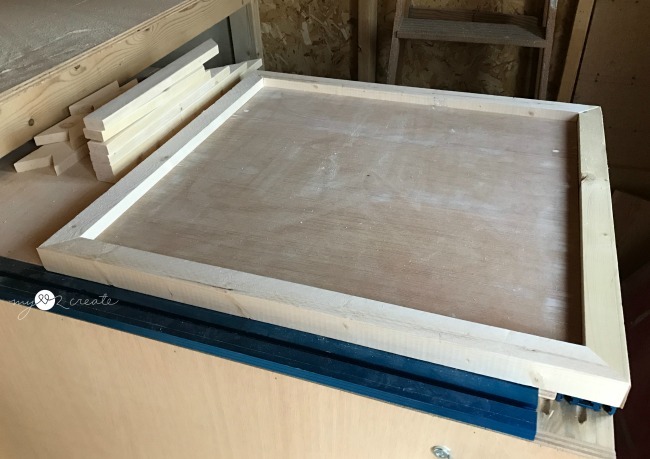 I cut my 2x2 pieces to fit around the plywood using 45 degree cuts on the miter saw. If you want to do a frame with square cuts, check out how in my Pottery Barn Knock off, "It's the Most Wonderful Time of the Year" Sign post. It's always a good idea to know where your center is and mark it. Weather you want your design centered or not, it can help you have a starting place. I decided to make some arrow shapes and wanted the point of my largest one to be on center. So this is where I started with my design. You can sketch out a design on paper or just wing it as you go, like I did...do what ever floats your boat! 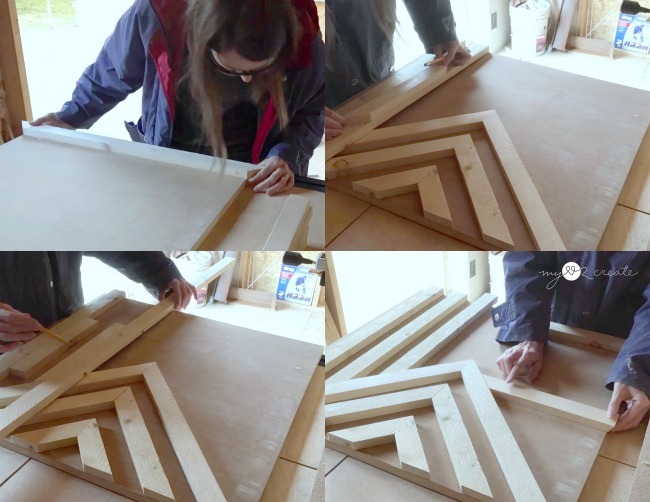 Using your 1x2 boards start creating your design. 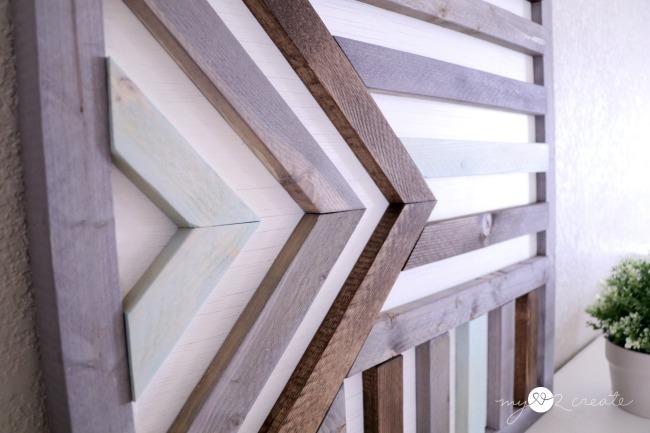 Place your boards on your plywood and try out different configurations, be creative! I wanted to keep this design simple and easy. I did this by using my 1x2's as spacers so I didn't have to measure! Sa-weet! You can see in the photo above the spacers helped while I measured and marked my cuts. All angles on this project were cut at 45 degrees on my miter saw. 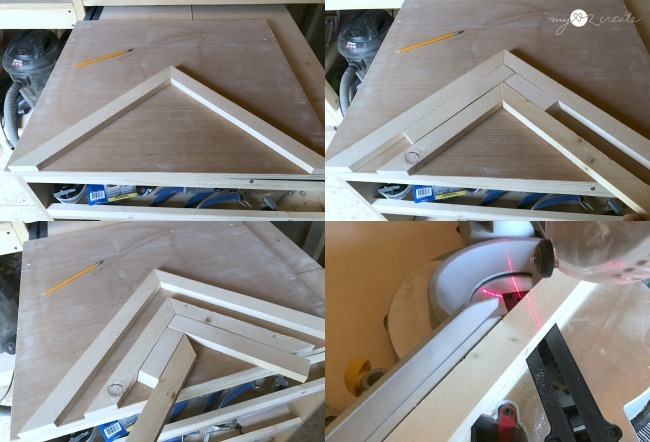 Start by cutting the 45 degree angle, then place it where you want on the board and mark where to make the second cut. No need to measure! I used the same process to do my straight boards. Measuring, marking, and cutting as I went. The scrap 1x2 boards as spacers are a great help too, don't forget to use them! 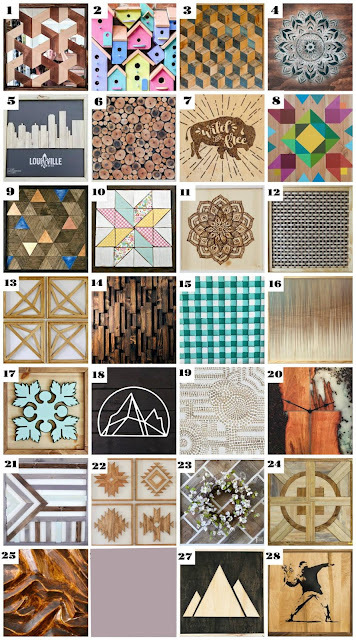 TIP- Once you have your design layed out on your plywood and all your cuts are made...take a picture or mark your pieces with numbers to help you remember the pattern. Trust me this is worth it! Sand all your pieces smooth. Step 4: Paint, Stain, and Build! I choose to paint my plywood white so my design pieces would pop. I layed out all my design pieces and used this , this , and this to stain my 2x2 frame pieces and 1x2 pieces. Having it layed out helps to make sure you are keeping the stains in a varied pattern as you go. Once I had everything painted and stained I attached my frame pieces to my plywood with wood glue and a nail gun using 2'' nails. 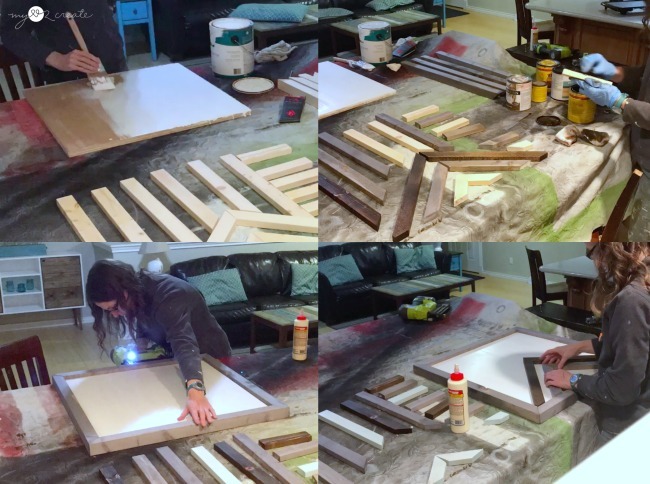 Then I used wood glue and placed my 1x2 design boards into the frame and let them dry. You could also put weights on to hold them in place like I did with my Wooden Triangle Hearts. Step 5: Display and enjoy your Art work! Once you are done show off your beautiful art in your home! Ahhh love!! It is so fun to create your own art! It looks great on my Modern Rustic Buffet, but I am sure it will be moved around the house...I like to change things up! 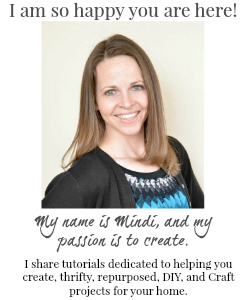 The best thing about this project is you really can't mess up, create any pattern you want! Having the space between the boards makes it easy and fast to create! 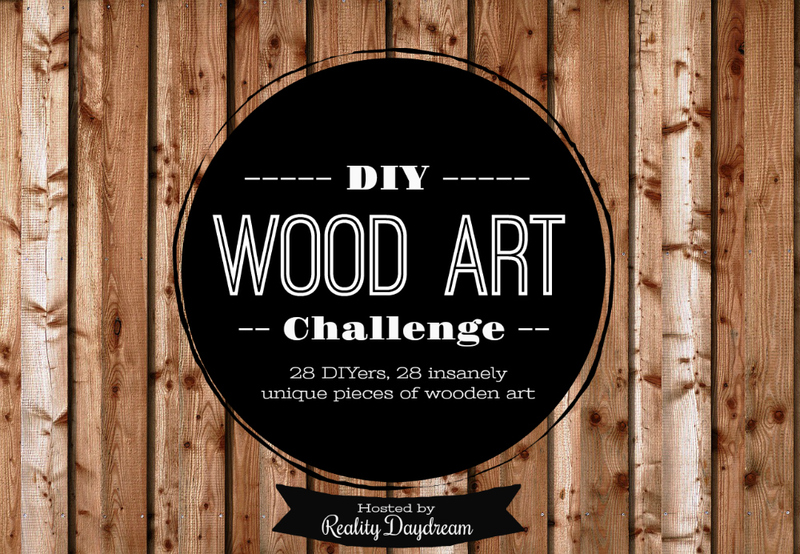 Be sure and pin this for later so you can make your own wooden wall art! Now for the Wood Art Challenge! 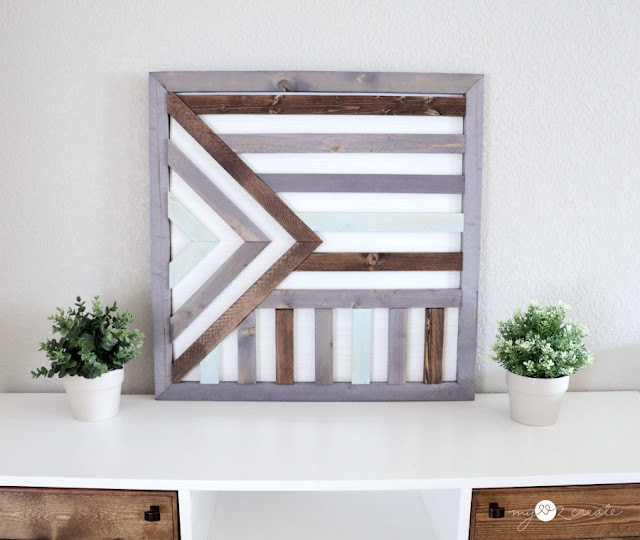 Check out all the other amazing wooden wall art ideas below from my blogging friends! 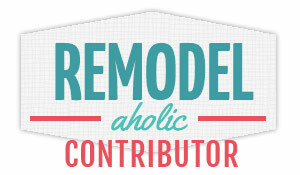 Be sure to click on their links to see more great tutorials! 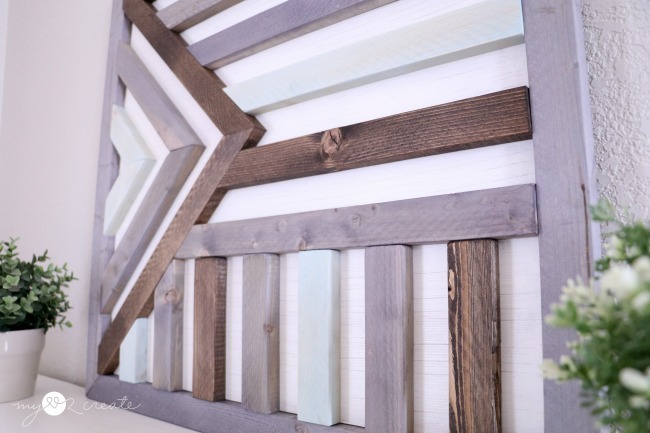 You are the queen of repurposed wood and cutting angles so this project screams My Love 2 Create! 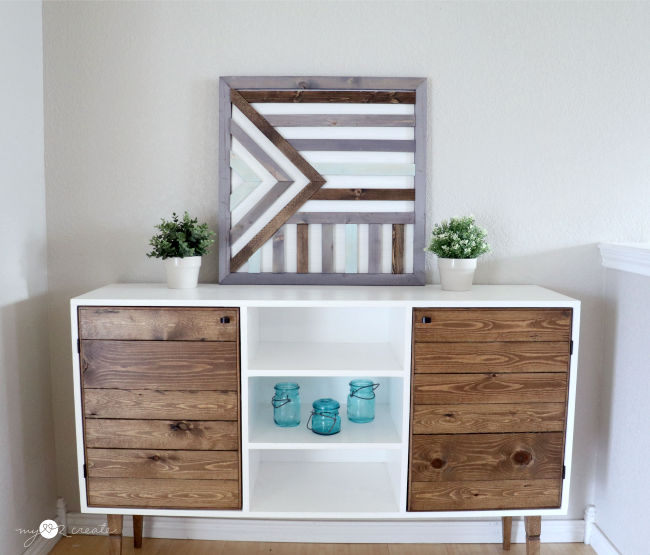 I love the colors and it looks fabulous on your modern rustic buffet!